AA917, Italy, Venice (for Albania & Dalmatia) Alvise II Mocenigo, Leone da 80 soldi ND, Silver (11.22g) F-VF, small scratch on Rev. 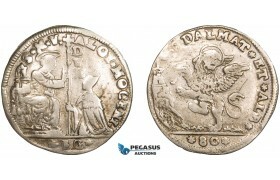 AA917, Italy, Venice (for Albania & Dalmatia) Alvise II Mocenigo, Leone da 80 soldi ND, Silver (..
10 Qindar Leku 1926-R, Rome. Obv. 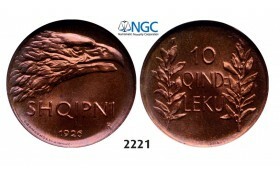 : Eaglersquo;s head right. Rev. : Value between olive branches. KM# ..
5 Qindar Leku, 1926-R, Rome. Obv. : Lion head left. Rev. : Value above oak branch. 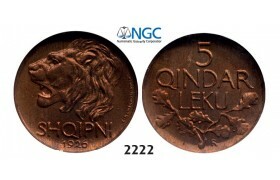 KM# 1 NGC MS65RB (0..